Contact us for more colours!! General Purpose Silicone is a high modulus silicone sealant that adheres to most smooth and non-porous materials. Contains an anti-fungal compound to prevent mould growth in areas of high humidity. Forms a permanently flexible rubber seal. It is ideal for applications in bathroom, shower rooms, utility rooms and general DIY applications including kitchen work tops. Easy to use grout refresher to rejuvenate the colour of comentitious grouted joints in floors and walls. may also be used to correct irregularities in colour due to incorrect grout application. helps obtain a uniform colour which absorbs less water and is easier to clean. Coverage:depends on the size of the tiles and joints. 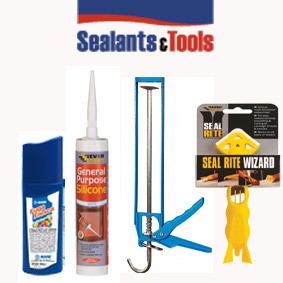 The Seal Rite Wizard is the worlds first multi-function sealant tool, the "Swiss Army Knife" of sealant tools with the following features: two points/edges to cut away old sealant; a blade to cut the sealant cartridge thread & nozzle; and a flexible rubber blade to smooth down new sealant - all designed to enable you to create the perfect seal every time.